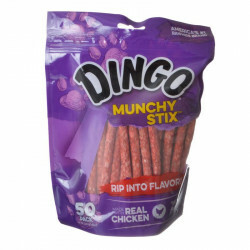 The Dingo Munchy Stix are premium, munchy rawhide and real chicken bits molded into easy to chew treats that dogs can't resist. 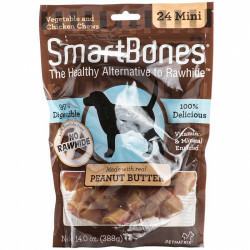 These treats are packed with real chicken and the delicious rawhide your dog craves! Select a chew slightly larger than your dog's mouth. Supervise consumption. Discard any chunks or fragments. Feed one per day for best results. Always provide plenty of clean fresh drinking water and visit your veterinarian regularly. 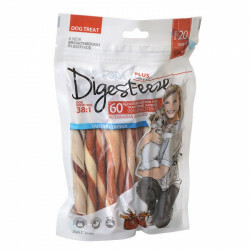 Ingredients: Rawhide, Chicken, Pork, Water, Corn Sugar, Salt, Potassium Sorbate (preservative), FD&C Red 40. 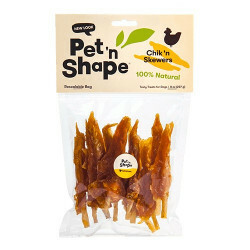 My dogs love these, this is the way to purchase! My older chocolate lab loves these, but my bloodhound can't pick them up off the ground and my bassethound won't touch them. Strange. Plus, the chocolate lab always has horrible breath now. I take my dog to a neighbor every day who "dog sits" her and has 2 dogs of his own. Every evening I take the dogs 2 Munchy Stix each. They are so excited to get them and love, love, love them. My three dogs were quite happy to see this delivery. They LOVE their Munchy Stix. My two Dorkie-poos love these. This is one treat they do not share with each other. They can't put it down or the other will take it and run.